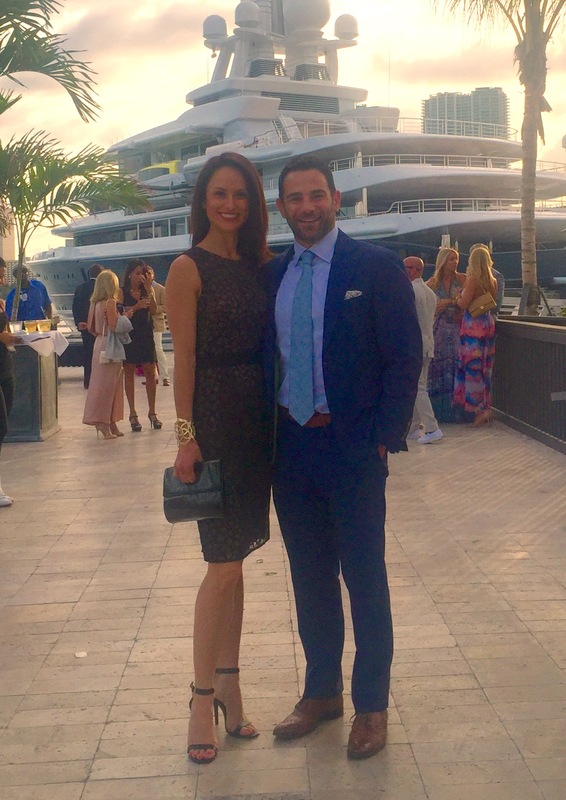 This past weekend we went to a fabulous wedding in Miami. We celebrated a new marriage, hung out with college friends we hadn’t seen in years, and got some much needed husband and wife time. The wedding and reception were at a yacht club and next to the venue was a 375-foot yacht called Luna. To say it was beautiful was a complete understatement. The thing was amazing. The venue, the bride, and the weather were also nearly perfect. I found myself feeling insecure. My hair didn’t feel right. My lip liner went on weird. My dress wasn’t fabulous. Surrounded by beauty and perfection, I found my flaws to be the center of my attention. Luckily it was early on in the evening when I gave myself a reality check. I told Chris that I was going to stop worrying about what I looked like and instead focus on being where I was. It wasn’t an easy shift. I struggled at times to feel comfortable in my own skin. The yacht was a major source of conversation for obvious reasons. We laughed about trying to sneak on it for after hours. Someone at the reception showed us another yacht nearby that supposedly belongs to Mark Cuban. Had the 375-footer not been there than surely we would have all been drooling over this one but it was so overshadowed that it was barely noticed. We searched the web for the Luna and learned that it’s worth roughly $575 million dollars. I contemplated that and realized that when it comes to money, there is never enough. As rich as you may be there is always something that you can not afford…a $60 million dollar condo in Miami, a $575 million dollar boat. Fact is, there is always going to be someone richer, prettier, smarter, or nicer than you. This ‘never enough’ mentally though only leads to failure. How can we ever consider ourselves enough if we are constantly comparing ourselves? How does moving the bar higher and higher ever lead to true happiness? I find that this is a constant underlying issue for me. A part of me worries that I’m not enough. I know that my best days are the ones that I don’t worry about the clothes I’m wearing, or the wrinkles around my eyes, or that my hair is all out of sorts. My best days are the days when I truly feel that I am enough, that perfection isn’t the goal, and that no one expects perfection from me in the first place. If Mark Cuban is sitting on his beautiful yacht being pissed that his boat isn’t as big as the Luna, than clearly he is missing it. It’s so easy to look at someone else’s life and see the big picture. It’s the moments when fear and insecurity seep in that we need to take a step back so that we can see ours. It is only then that we can see that who we are and what we have is more than enough. I know you aren’t fishing for compliments, but I thought you looked flawless both nights!! I didn’t notice any wrinkles on you, I thought you looked stunning … and you didn’t look fake like a lot of the women from Boca. I thought your dress was so sophisticated. The detail on your dress looked better in person, the photographs didn’t do it justice.I was wishing my teeth were as white as yours, and thinking I need to schedule an appointment for botox & fillers because I was really insecure about my wrinkles. And even if I had gotten my teeth whitened, fillers & botox before the trip, I’m sure I would have felt some other insecurity. You are so right, most of us have a ‘never enough’ mentality. God, thank you for this Gina…not because of the compliments (although appreciated) but because you understand. Thanks for taking the time to reach out. And ps…I thought you looked great too. We are always so much harder on ourselves than others.